I'm the last person I expected to be creating this thread, but it was going to be made by someone sooner or later. If you enjoyed Strike Witches and Upotte, this show looks right up your alley. YES! Finally this particular genre has arrived! This reeks of "Strike Witches" for some reason. Premise sounds like a tank edition of Upotte!. Tsutomu Mizushima is directing so sign me up,as long as this guy doesn't do horror he's fine. Should be a fun lighthearted show. the designs reek of deen so im gonna pass. For me, the designs do not look like DEEN at all, it just look like a typical 2006/2007 slice of life anime in the lines of Manabi Straight or Sketchbook full color. I still don't think DEEN would animate this, but rather Diomedea or Nomad. well considering i actually did enjoy Strike Witches. I will probably check this out too. Takaaki Suzuki, a military history advisor on Strike Witches and Upotte! 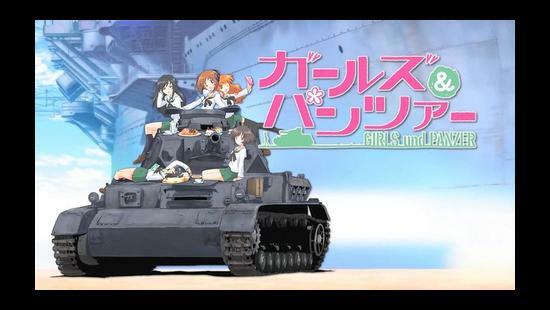 !, revealed a new television anime called Girls und Panzer (Girls & Tanks) on Thursday. Bandai Visual publicity representative Yūji Hirooka (Eureka 7: AO, Horizon in the Middle of Nowhere) also said that he is involved, and producer Kiyoshi Sugiyama (Armored Trooper Votoms Case;Irvine, Blue Submarine No. 6, Yukikaze) added that the project has been in development for a year and a half. Director Tsutomu Mizushima (Squid Girl, Another, Blood-C, xxxHOLiC) chimed in that the “pleasant school story” is his first entirely original work (as opposed to an anime based on a previous manga or novel). The official website for the project will open later on Thursday at 8:00 p.m. (7:00 a.m. EDT) with a promotional video that is about two minutes long, the main staff list, and part of the main cast. Ryūichi Saitaniya will launch a manga series, tentatively titled Girls & Panzer, in the July issue of Media Factory’s Comic Flapper magazine on June 5. The “military teen battle action” manga is about “high school girls x battles in tanks.” It is not stated whether the manga is inspiring the anime, the anime is inspiring the manga, or if the two projects are parallel developments. Where did you guys see the chara designs, I don't see anything on the website? Some images from the promo video here. Now Panzers have their own harem already and I still don't have one (harem that is). It's got tanks, count me in. Not enough anime that revolve around tanks, even less on real life ones, got nothing against the sci-fi/futuristic ones but I'd like to see more real life ones. Altho tanks + girls would usually mean win to me, I'd prefer something a little more serious looking but I'll take it. Character designs are indeed a bit "bleh". Still, it's a pretty weird concept. Could work. I mean, Tanks are cool. Especially when they're called Panzers. Judging from what I searched on Google, this German tank type -- especially the Panzer IV -- is by far one of the most popular designs, and it dominated the battlefield for a time, destroying anything else in its way, until it found its formidable match in the form of the Russian T-34. Sometimes I read borrowed copies of ARMS Magazine, and often Japanese military buffs (who double as columnists within that mag) love the Panzers. Man, I'm thinking about the battle tank game I used to play: Core Design's Shellshock for the Playstation. If this is tame Mizushima, it'll be worthless, but if this is crazy Mizushima, it could be a lot of fun! So we'll see.